When composer/bandleader Maria Schneider performed at Ted Mann Concert Hall about two years ago, she introduced “The Pretty Road,” describing a childhood memory of her hometown, Windom, MN. I recall that half the town of Windom was in the audience. Well, maybe not that many but friends and family were clearly in abundance. Maria told of the wonder she experienced when her family would take a certain country road, how the lights of the small town would sparkle as the car came over the rise enroute home. On Sky Blue, Schneider leads her long-standing ensemble of 18+ musicians (21 are involved in this recording project), a jazz orchestra of modern improvisers whose sustained collaboration harkens back to Ellington. 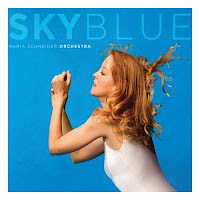 A protégé of Gil Evans, Schneider’s talents as composer and arranger have no peer in the world of modern jazz big band, and for me, Sky Blue has no competition for my favorite recording of 2007. From start to finish, Sky Blue evolves as a five-party symphony combining classical and jazz elements to create a majestic tapestry that reaches skyward like an Ellington sacred concert or Copeland orchestration. “The Pretty Road” is just the beginning. “Aires de Lando” is a passionate tango featuring the songful clarinet of Scott Robinson, while the hymnal “Rich’s Piece” was conceived as a showcase for tenor saxophonist Rich Perry. Schneider gained a second Grammy nomination for instrumental composition for the 21+ minute opus, “Cerulean Skies,” which not only features stellar soloists (Donny McCaslin on tenor sax, Charles Pillow on alto, and Gary Versace on accordion) but the vocalizations of Brazilian vocalist Luciana Souza and horns translated into bird calls. Within a total work of heavenly elegance, “Cerulean Skies” is the epiphany, filled with symphonic hornlines, incomparably sacred harmonics, celestial tinkerings from pianist Frank Kimbrough, other-worldly sound effects from Gary Versace’s accordion and a list of others contributing the sounds of “bird,” “high chirps,” and a series of “twittering birds.” “Sky Blue” closes the recording as balladic hymn built around Steve Wilson’s soprano sax, which, like other instruments on the preceding track, often mimics the call of birds against the surging harmonies of the horn choir. In 2005, Schneider received the Grammy for Best Jazz Recording for her Concert in the Garden, the first winner in Grammy history without in-store distribution. Like Sky Blue, it was produced through ArtistShare, the collective of musicians who are finding considerable success as their own producers and marketing agents. Sky Blue might bring Schneider and ArtistShare another Grammy. I can’t imagine otherwise. A friend, who is an expert in big band music, questioned classifying Sky Blue as a jazz work. “It doesn’t swing,” he said. In the traditional view of “swing,” Schneider’s music only qualifies intermittently and subtly. But her emphasis group harmony and solo improvisation, with touches of blues, tango and folk roots, is far beyond the forms of classical music. Sky Blue not only moves forward, it moves skyward. It propels the listener to a higher plane. And that is really the essence of “swing” in the 21st century.